The much-rumored Street 500 Harley-Davidson has been unveiled to the world motorcycling press, with events running around the world to introduce the new bike, and it’s 750cc variant, today. Priced at around $10-12,000, the XG500 should be a big seller. Unfortunately Australia isn’t expected to get any until early January 2015. 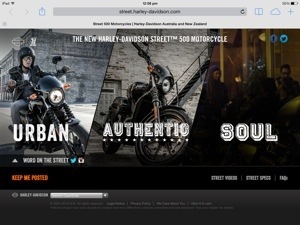 Aimed at a world market and being manufactured both in Kansas and India, the ‘Street’ is aimed at the young adult and returning motorcyclists markets, as well as the obvious LAM market. Built for urban environments – nimble handling, good looking, fast steering and quick-revving – the new Street 500 is designed to appeal to a new range of riders. Harley will introduce the bike with a huge range of accessories and options so owners can customize their Street to their desire. Powering the bike is an all-new SOHC 60-degree liquid-cooled motor. Similar specs to the V-Rod, but it’s an all-new design and platform. The engine is the first Revolution X engine series. A complete bike weighs in at a little over 200kg, has a low seat height and is aimed at encouraging people to ride.